Ballinlough travelled to Skyrne last Friday and were unlucky to come away with only a point as the home side got the last two scores of the game in this Division 1 A-League battle. 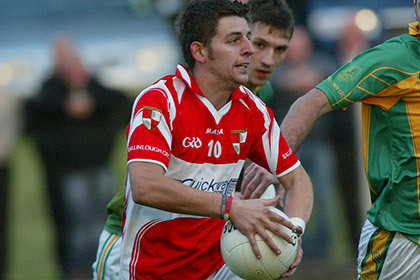 Ballinlough played free from the edginess that scuppered their chances of pulling off an upset against the same opposition in championship the previous weekend. Despite trailing by five points; 1-4 to 0-2, after just 20 minutes on the clock they battled away gamely and gradually showed some of the work ethic and cohesion which made them formidable opposition during the second half of 2014. The scores were level after ten minutes of play - two points each - with John Morley getting both Skryne scores. In between those two points Skryne kicked six wides which almost proved costly at the end of a sometimes over-robust game. Referee Seamus O'Connor was forced to book a number of players from both sides and issued a black card to a Skryne’s Niall O’ Brien and a red card and a red card (following two yellows) to Ballinlough’s Ronan Mc Guinness. Skryne led at half time by 1-4 to 0-3, but Ballinlough gained the upperhand around the middle third early in the second half and quickly set about reducing the deficit with 1-2 without reply, the North Meath outfit were 1-5 to 1-4 ahead after 40 minutes. Conor O’ Brien and Ciaran Lenehan got the next two scores of the game as Skyrne reclaimed the lead; 1-6 to 1-5, but just when it seemed the visitors might be wavering they showed tremendous believe to dig deep and regain the lead. Kevin Devine kicked the equaliser and then James O’ Higgins latched on to a breaking ball and finished the ball neatly to the net, Ballinlough had moved two points ahead; 2-6 to 1-7, with just ten minutes remaining. The Skyrne selectors introduced four substitutes to freshen things up late in the game and it almost worked. The home side clawed their way back into contention and with time almost up they trailed by only a point, Ballinlough missed a couple of good scoring chances before Ciaran Lenehan posted the last point of the game to bring an exciting conclusion to a keenly contested match. Ballinlough had good performances from Benji Smith, who once again kept a tight reign on Skyrne danger man Mark Battersby, Jonnie Reilly who returned to defence and Cian Mallen. But a special mention must go to substitute James O’ Higgins who scored 2-1 in the second half, the corner forward had three shots and on all three occasions he hit the target, his ability to improve Ballinlough’s conversion rate was probably the difference between their result against the same opposition in league and championship. Skryne - Ian Gillette. Neil Lenehan, Ciaran Lenehan (0-2), Mark Jordan. Ronan McCabe, Thomas McKeown, Adam O'Sullivan. Aidan Tuite, Donie Ryan. Paddy Fox, Stephen O'Brien, Conor O'Brien (0-1). John Morley (1-3), Brian Davis (0-1), Mark Battersby (0-3). Subs used - Vinny O'Reilly, Allan Carty, James Looby and Neal Burke.